The West Coast of Vancouver Island is rugged and wild. Up and down the coast are many Sounds that reach deep inland forming, bays, coves, inlets and channels. Surf of the Pacific Ocean pounds against the shoreline cutting deep into the rock and rides over the sandy beaches, and old-growth temperate rain forests cover the land. The area is majestic and enchanting. Tofino and Ucluelet are the two favourite northern gray whale watching communities on the West Coast of Vancouver Island. People from all parts of the world come here to watch these magnificent creatures of the deep. During the months of March and April, more than 20,000 gray whales swim north from their breeding grounds in Baja California to their feeding grounds in Alaska. On their way north, the gray whales pass close to shore in this region of British Columbia. A pod of whales summers over near Tofino, waiting for the southern migration, so whale watching is possible during the summer months. To celebrate the migration of the northern gray whales, every spring the residents hold the Pacific Rim Whale Festival that attracts thousands of avid whale watchers. Sea otters have been re-introduced in this area of the West Coast and are slowly making a come back. 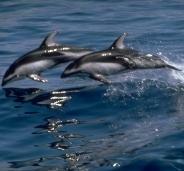 This small marine mammal is a protected and endangered species. Look for it in kelp beds and rocky shorelines. 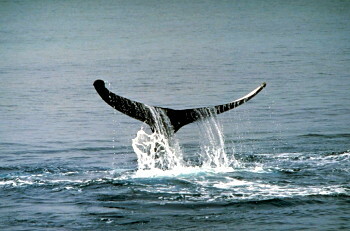 Humpback whales, commonly known for their displays of breaching, are occasionally sighted in this region. 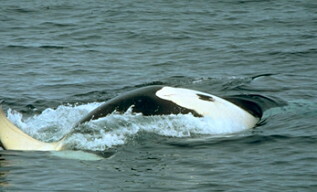 Harbour porpoises, harbour seals, California sea lions are all part of the marine wildlife in this part of British Columbia. Marine birds and nestling bald eagles are often seen as they soar and swoop looking for food.